C. Partl, S. Gratzl, M. Streit, A. Wassermann, H. Pfister, D. Schmalstieg, A. Lex. Pathfinder: Visual Analysis of Paths in Graphs, In Computer Graphics Forum (EuroVis '16), Vol. 35, No. 3, pp. 71-80. jun, 2016. The analysis of paths in graphs is highly relevant in many domains. Typically, path-related tasks are performed in node-link layouts. Unfortunately, graph layouts often do not scale to the size of many real world networks. Also, many networks are multivariate, i.e., contain rich attribute sets associated with the nodes and edges. These attributes are often critical in judging paths, but directly visualizing attributes in a graph layout exacerbates the scalability problem. In this paper, we present visual analysis solutions dedicated to path-related tasks in large and highly multivariate graphs. We show that by focusing on paths, we can address the scalability problem of multivariate graph visualization, equipping analysts with a powerful tool to explore large graphs. We introduce Pathfinder, a technique that provides visual methods to query paths, while considering various constraints. The resulting set of paths is visualized in both a ranked list and as a node-link diagram. For the paths in the list, we display rich attribute data associated with nodes and edges, and the node-link diagram provides topological context. The paths can be ranked based on topological properties, such as path length or average node degree, and scores derived from attribute data. Pathfinder is designed to scale to graphs with tens of thousands of nodes and edges by employing strategies such as incremental query results. We demonstrate Pathfinder's fitness for use in scenarios with data from a coauthor network and biological pathways. Y. Pathak, O. Salami, S. Baillet, Z. Li, C.R. Butson. Longitudinal Changes in Depressive Circuitry in Response to Neuromodulation Therapy, In Frontiers in Neural Circuits, Vol. 10, rontiers Media SA, July, 2016. Major depressive disorder (MDD) is a public health problem worldwide. There is increasing interest in using non-invasive therapies such as repetitive transcranial magnetic stimulation (rTMS) to treat MDD. However, the changes induced by rTMS on neural circuits remain poorly characterized. The present study aims to test whether the brain regions previously targeted by deep brain stimulation (DBS) in the treatment of MDD respond to rTMS, and whether functional connectivity (FC) measures can predict clinical response. rTMS (20 sessions) was administered to five MDD patients at the left-dorsolateral prefrontal cortex (L-DLPFC) over 4 weeks. Magnetoencephalography (MEG) recordings and Montgomery-Asberg depression rating scale (MADRS) assessments were acquired before, during and after treatment. Our primary measures, obtained with MEG source imaging, were changes in power spectral density (PSD) and changes in FC as measured using coherence. Of the five patients, four met the clinical response criterion (40% or greater decrease in MADRS) after 4 weeks of treatment. An increase in gamma power at the L-DLPFC was correlated with improvement in symptoms. We also found that increases in delta band connectivity between L-DLPFC/amygdala and L-DLPFC/pregenual anterior cingulate cortex (pACC), and decreases in gamma band connectivity between L-DLPFC/subgenual anterior cingulate cortex (sACC), were correlated with improvements in depressive symptoms. Our results suggest that non-invasive intervention techniques, such as rTMS, modulate the ongoing activity of depressive circuits targeted for DBS, and that MEG can capture these changes. Gamma oscillations may originate from GABA-mediated inhibition, which increases synchronization of large neuronal populations, possibly leading to increased long-range FC. We postulate that responses to rTMS could provide valuable insights into early evaluation of patient candidates for DBS surgery. I.A. Polejaeva, R. Ranjan, C.J. Davies, M. Regouski, J. Hall, A.L. Olsen, Q. Meng, H.M. Rutigliano, D.J. Dosdall, N.A. Angel, F.B. Sachse, T. Seidel, A.J. Thomas, R. Stott, K.E. Panter, P.M. Lee, A.J. Van Wettere, J.R. Stevens, Z. Wang, R.S. Macleod, N.F. Marrouche, K.L. White. Increased Susceptibility to Atrial Fibrillation Secondary to Atrial Fibrosis in Transgenic Goats Expressing Transforming Growth Factor-β1, In Journal of Cardiovascular Electrophysiology, Vol. 27, No. 10, Wiley-Blackwell, pp. 1220--1229. Aug, 2016. Large animal models of progressive atrial fibrosis would provide an attractive platform to study relationship between structural and electrical remodeling in atrial fibrillation (AF). Here we established a new transgenic goat model of AF with cardiac specific overexpression of TGF-β1 and investigated the changes in the cardiac structure and function leading to AF. Transgenic goats with cardiac specific overexpression of constitutively active TGF-β1 were generated by somatic cell nuclear transfer. We examined myocardial tissue, ECGs, echocardiographic data, and AF susceptibility in transgenic and wild-type control goats. Transgenic goats exhibited significant increase in fibrosis and myocyte diameters in the atria compared to controls, but not in the ventricles. P-wave duration was significantly greater in transgenic animals starting at 12 months of age, but no significant chamber enlargement was detected, suggesting conduction slowing in the atria. Furthermore, this transgenic goat model exhibited a significant increase in AF vulnerability. Six of 8 transgenic goats (75%) were susceptible to AF induction and exhibited sustained AF (>2 minutes), whereas none of 6 controls displayed sustained AF (P < 0.01). Length of induced AF episodes was also significantly greater in the transgenic group compared to controls (687 ± 212.02 seconds vs. 2.50 ± 0.88 seconds, P < 0.0001), but no persistent or permanent AF was observed. A novel transgenic goat model with a substrate for AF was generated. In this model, cardiac overexpression of TGF-β1 led to an increase in fibrosis and myocyte size in the atria, and to progressive P-wave prolongation. We suggest that these factors underlie increased AF susceptibility. M. Raj, M. Mirzargar, R. Kirby, R. Whitaker, J. Preston. Evaluating Shape Alignment via Ensemble Visualization, In IEEE Computer Graphics and Applications, Vol. 36, No. 3, IEEE, pp. 60--71. May, 2016. The visualization of variability in surfaces embedded in 3D, which is a type of ensemble uncertainty visualization, provides a means of understanding the underlying distribution of a collection or ensemble of surfaces. This work extends the contour boxplot technique to 3D and evaluates it against an enumeration-style visualization of the ensemble members and other conventional visualizations used by atlas builders. The authors demonstrate the efficacy of using the 3D contour boxplot ensemble visualization technique to analyze shape alignment and variability in atlas construction and analysis as a real-world application. I. Rodero, M. Parashar, A.G. Landge, S. Kumar, V. Pascucci,, P.T. Bremer. Evaluation of in-situ analysis strategies at scale for power efficiency and scalability, In Cluster, Cloud and Grid Computing (CCGrid), 2016 16th IEEE/ACM International Symposium on, IEEE, pp. 156--164. 2016. The increasing gap between available compute power and I/O capabilities is resulting in simulation pipelines running on leadership computing facilities being reformulated. In particular, in-situ processing is complementing conventional post-process analysis; however, it can be performed by using the same compute resources as the simulation or using secondary dedicated resources. In this paper, we focus on three different in-situ analysis strategies, which use the same compute resources as the ongoing simulation but different data movement strategies. We evaluate the costs incurred by these strategies in terms of run time, scalability and power/energy consumption. Furthermore, we extrapolate power behavior to peta-scale and investigate different design choices through projections. Experimental evaluation at full machine scale on Titan supports that using fewer cores per node for in-situ analysis is the optimum choice in terms of scalability. Hence, further research effort should be devoted towards developing in-situ analysis techniques following this strategy in future high-end systems. P. Rosen, B. Burton, K. Potter, C.R. Johnson. muView: A Visual Analysis System for Exploring Uncertainty in Myocardial Ischemia Simulations, In Visualization in Medicine and Life Sciences III, Springer Nature, pp. 49--69. 2016. In this paper we describe the Myocardial Uncertainty Viewer (muView or µView) system for exploring data stemming from the simulation of cardiac ischemia. The simulation uses a collection of conductivity values to understand how ischemic regions effect the undamaged anisotropic heart tissue. 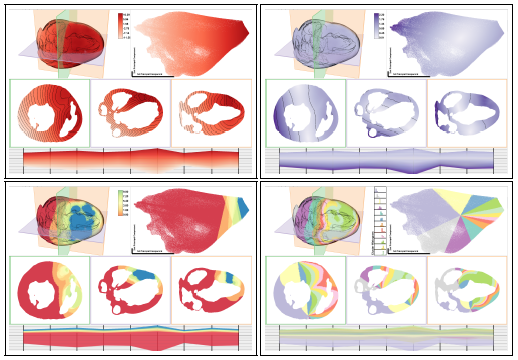 The data resulting from the simulation is multi-valued and volumetric, and thus, for every data point, we have a collection of samples describing cardiac electrical properties. µView combines a suite of visual analysis methods to explore the area surrounding the ischemic zone and identify how perturbations of variables change the propagation of their effects. 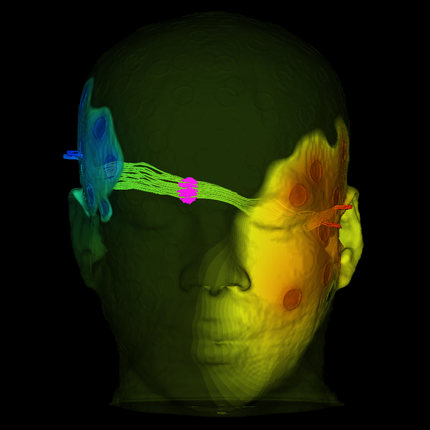 In addition to presenting a collection of visualization techniques, which individually highlight different aspects of the data, the coordinated view system forms a cohesive environment for exploring the simulations.We also discuss the findings of our study, which are helping to steer further development of the simulation and strengthening our collaboration with the biomedical engineers attempting to understand the phenomenon. U. Rüde, K. Willcox, L. C. McInnes, H. De Sterck, G. Biros, H. Bungartz, J. Corones, E. Cramer, J. Crowley, O. Ghattas, M. Gunzburger, M. Hanke, R. Harrison, M. Heroux, J. Hesthaven, P. Jimack, C. Johnson, K. E. Jordan, D. E. Keyes, R. Krause, V. Kumar, S. Mayer, J. Meza, K. M. Mørken, J. T. Oden, L. Petzold, P. Raghavan, S. M. Shontz, A. Trefethen, P. Turner, V. Voevodin, B. Wohlmuth, C. S. Woodward. Research and Education in Computational Science and Engineering, Subtitled Report from a workshop sponsored by the Society for Industrial and Applied Mathematics (SIAM) and the European Exascale Software Initiative (EESI-2), Aug, 2016. Over the past two decades the field of computational science and engineering (CSE) has penetrated both basic and applied research in academia, industry, and laboratories to advance discovery, optimize systems, support decision-makers, and educate the scientific and engineering workforce. Informed by centuries of theory and experiment, CSE performs computational experiments to answer questions that neither theory nor experiment alone is equipped to answer. CSE provides scientists and engineers of all persuasions with algorithmic inventions and software systems that transcend disciplines and scales. Carried on a wave of digital technology, CSE brings the power of parallelism to bear on troves of data. Mathematics-based advanced computing has become a prevalent means of discovery and innovation in essentially all areas of science, engineering, technology, and society; and the CSE community is at the core of this transformation. However, a combination of disruptive developments---including the architectural complexity of extreme-scale computing, the data revolution that engulfs the planet, and the specialization required to follow the applications to new frontiers---is redefining the scope and reach of the CSE endeavor. This report describes the rapid expansion of CSE and the challenges to sustaining its bold advances. The report also presents strategies and directions for CSE research and education for the next decade. M. Sajjadi, S.M. Seyedhosseini, T. Tasdizen. Disjunctive Normal Networks, In Neurocomputing, Vol. 218, Elsevier BV, pp. 276--285. Dec, 2016. Artificial neural networks are powerful pattern classifiers. They form the basis of the highly successful and popular Convolutional Networks which offer the state-of-the-art performance on several computer visions tasks. However, in many general and non-vision tasks, neural networks are surpassed by methods such as support vector machines and random forests that are also easier to use and faster to train. One reason is that the backpropagation algorithm, which is used to train artificial neural networks, usually starts from a random weight initialization which complicates the optimization process leading to long training times and increases the risk of stopping in a poor local minima. Several initialization schemes and pre-training methods have been proposed to improve the efficiency and performance of training a neural network. However, this problem arises from the architecture of neural networks. We use the disjunctive normal form and approximate the boolean conjunction operations with products to construct a novel network architecture. The proposed model can be trained by minimizing an error function and it allows an effective and intuitive initialization which avoids poor local minima. We show that the proposed structure provides efficient coverage of the decision space which leads to state-of-the art classification accuracy and fast training times. M. Sajjadi, M. Javanmardi, T. Tasdizen. Regularization With Stochastic Transformations and Perturbations for Deep Semi-Supervised Learning, In CoRR, Vol. abs/1606.04586, 2016. Effective convolutional neural networks are trained on large sets of labeled data. However, creating large labeled datasets is a very costly and time-consuming task. Semi-supervised learning uses unlabeled data to train a model with higher accuracy when there is a limited set of labeled data available. In this paper, we consider the problem of semi-supervised learning with convolutional neural networks. Techniques such as randomized data augmentation, dropout and random max-pooling provide better generalization and stability for classifiers that are trained using gradient descent. Multiple passes of an individual sample through the network might lead to different predictions due to the non-deterministic behavior of these techniques. We propose an unsupervised loss function that takes advantage of the stochastic nature of these methods and minimizes the difference between the predictions of multiple passes of a training sample through the network. We evaluate the proposed method on several benchmark datasets. M. Sajjadi, M. Javanmardi, T. Tasdizen. Mutual exclusivity loss for semi-supervised deep learning, In 2016 IEEE International Conference on Image Processing (ICIP), IEEE, September, 2016. In this paper we consider the problem of semi-supervised learning with deep Convolutional Neural Networks (ConvNets). Semi-supervised learning is motivated on the observation that unlabeled data is cheap and can be used to improve the accuracy of classifiers. In this paper we propose an unsupervised regularization term that explicitly forces the classifier's prediction for multiple classes to be mutually-exclusive and effectively guides the decision boundary to lie on the low density space between the manifolds corresponding to different classes of data. Our proposed approach is general and can be used with any backpropagation-based learning method. We show through different experiments that our method can improve the object recognition performance of ConvNets using unlabeled data. S.M. Seyedhosseini, T. Tasdizen. Semantic Image Segmentation with Contextual Hierarchical Models, In IEEE Transactions on Pattern Analysis and Machine Intelligence, Vol. 38, No. 5, IEEE, pp. 951--964. May, 2016. Semantic segmentation is the problem of assigning an object label to each pixel. It unifies the image segmentation and object recognition problems. The importance of using contextual information in semantic segmentation frameworks has been widely realized in the field. We propose a contextual framework, called contextual hierarchical model (CHM), which learns contextual information in a hierarchical framework for semantic segmentation. At each level of the hierarchy, a classifier is trained based on downsampled input images and outputs of previous levels. Our model then incorporates the resulting multi-resolution contextual information into a classifier to segment the input image at original resolution. This training strategy allows for optimization of a joint posterior probability at multiple resolutions through the hierarchy. Contextual hierarchical model is purely based on the input image patches and does not make use of any fragments or shape examples. Hence, it is applicable to a variety of problems such as object segmentation and edge detection. We demonstrate that CHM performs at par with state-of-the-art on Stanford background and Weizmann horse datasets. It also outperforms state-of-the-art edge detection methods on NYU depth dataset and achieves state-of-the-art on Berkeley segmentation dataset (BSDS 500). H. De Sterck, C. Johnson,, L. C. McInnes. Special Section on Two Themes: CSE Software and Big Data in CSE, In SIAM J. Sci. Comput, Vol. 38, No. 5, SIAM, pp. S1--S2. 2016. The 2015 SIAM Conference on Computational Science and Engineering (CSE) was held March 14-18, 2015, in Salt Lake City, Utah. The SIAM Journal on Scientific Computing (SISC) created this special section in association with the CSE15 conference. The special section focuses on two topics that are of significant current interest to CSE researchers: CSE software and big data in CSE. D. Sunderland, B. Peterson, J. Schmidt, A. Humphrey, J. Thornock,, M. Berzins. An Overview of Performance Portability in the Uintah Runtime System Through the Use of Kokkos, In Proceedings of the Second Internationsl Workshop on Extreme Scale Programming Models and Middleware, Salt Lake City, Utah, ESPM2, IEEE Press, Piscataway, NJ, USA pp. 44--47. 2016. The current diversity in nodal parallel computer architectures is seen in machines based upon multicore CPUs, GPUs and the Intel Xeon Phi's. A class of approaches for enabling scalability of complex applications on such architectures is based upon Asynchronous Many Task software architectures such as that in the Uintah framework used for the parallel solution of solid and fluid mechanics problems. Uintah has both an applications layer with its own programming model and a separate runtime system. While Uintah scales well today, it is necessary to address nodal performance portability in order for it to continue to do. Incrementally modifying Uintah to use the Kokkos performance portability library through prototyping experiments results in improved kernel performance by more than a factor of two. D. Sunderland, B. Peterson, J. Schmidt, A. Humphrey, J. Thornock, M. Berzins. An Overview of Performance Portability in the Uintah Runtime System through the Use of Kokkos, In 2016 Second International Workshop on Extreme Scale Programming Models and Middlewar (ESPM2), IEEE, Nov, 2016. X. Tong, J. Edwards, C. Chen, H. Shen, C. R. Johnson, P. Wong. View-Dependent Streamline Deformation and Exploration, In Transactions on Visualization and Computer Graphics, Vol. 22, No. 7, IEEE, pp. 1788--1801. July, 2016. Occlusion presents a major challenge in visualizing 3D flow and tensor fields using streamlines. Displaying too many streamlines creates a dense visualization filled with occluded structures, but displaying too few streams risks losing important features. We propose a new streamline exploration approach by visually manipulating the cluttered streamlines by pulling visible layers apart and revealing the hidden structures underneath. This paper presents a customized view-dependent deformation algorithm and an interactive visualization tool to minimize visual clutter in 3D vector and tensor fields. The algorithm is able to maintain the overall integrity of the fields and expose previously hidden structures. Our system supports both mouse and direct-touch interactions to manipulate the viewing perspectives and visualize the streamlines in depth. By using a lens metaphor of different shapes to select the transition zone of the targeted area interactively, the users can move their focus and examine the vector or tensor field freely. W. Usher, I. Wald, A. Knoll, M. Papka, V. Pascucci. In Situ Exploration of Particle Simulations with CPU Ray Tracing, In Supercomputing Frontiers and Innovations, Vol. 3, No. 4, 2016. We present a system for interactive in situ visualization of large particle simulations, suitable for general CPU-based HPC architectures. As simulations grow in scale, in situ methods are needed to alleviate IO bottlenecks and visualize data at full spatio-temporal resolution. We use a lightweight loosely-coupled layer serving distributed data from the simulation to a data-parallel renderer running in separate processes. Leveraging the OSPRay ray tracing framework for visualization and balanced P-k-d trees, we can render simulation data in real-time, as they arrive, with negligible memory overhead. This flexible solution allows users to perform exploratory in situ visualization on the same computational resources as the simulation code, on dedicated visualization clusters or remote workstations, via a standalone rendering client that can be connected or disconnected as needed. 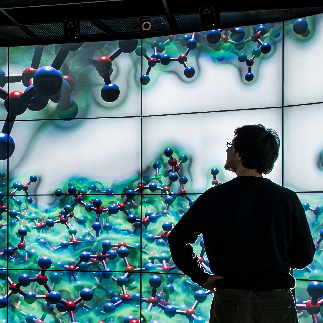 We evaluate this system on simulations with up to 227M particles in the LAMMPS and Uintah computational frameworks, and show that our approach provides many of the advantages of tightly-coupled systems, with the flexibility to render on a wide variety of remote and co-processing resources. E. Wong, S. Palande, Bei Wang, B. Zielinski, J. Anderson, P. T. Fletcher. Kernel Partial Least Squares Regression for Relating Functional Brain Network Topology to Clinical Measures of Behavior, In 2016 IEEE 13th International Symposium on Biomedical Imaging (ISBI), IEEE, April, 2016. In this paper we present a novel method for analyzing the relationship between functional brain networks and behavioral phenotypes. Drawing from topological data analysis, we first extract topological features using persistent homology from functional brain networks that are derived from correlations in resting-state fMRI. Rather than fixing a discrete network topology by thresholding the connectivity matrix, these topological features capture the network organization across all continuous threshold values. We then propose to use a kernel partial least squares (kPLS) regression to statistically quantify the relationship between these topological features and behavior measures. The kPLS also provides an elegant way to combine multiple image features by using linear combinations of multiple kernels. In our experiments we test the ability of our proposed brain network analysis to predict autism severity from rs-fMRI. We show that combining correlations with topological features gives better prediction of autism severity than using correlations alone. K.K. Aras, W. Good, J. Tate, B.M. Burton, D.H. Brooks, J. Coll-Font, O. Doessel, W. Schulze, D. Patyogaylo, L. Wang, P. Van Dam,, R.S. MacLeod. Experimental Data and Geometric Analysis Repository: EDGAR, In Journal of Electrocardiology, 2015. The "Experimental Data and Geometric Analysis Repository", or EDGAR is an Internet-based archive of curated data that are freely distributed to the international research community for the application and validation of electrocardiographic imaging (ECGI) techniques. The EDGAR project is a collaborative effort by the Consortium for ECG Imaging (CEI, ecg-imaging.org), and focused on two specific aims. One aim is to host an online repository that provides access to a wide spectrum of data, and the second aim is to provide a standard information format for the exchange of these diverse datasets. The EDGAR system is composed of two interrelated components: 1) a metadata model, which includes a set of descriptive parameters and information, time signals from both the cardiac source and body-surface, and extensive geometric information, including images, geometric models, and measure locations used during the data acquisition/generation; and 2) a web interface. This web interface provides efficient, search, browsing, and retrieval of data from the repository. An aggregation of experimental, clinical and simulation data from various centers is being made available through the EDGAR project including experimental data from animal studies provided by the University of Utah (USA), clinical data from multiple human subjects provided by the Charles University Hospital (Czech Republic), and computer simulation data provided by the Karlsruhe Institute of Technology (Germany). It is our hope that EDGAR will serve as a communal forum for sharing and distribution of cardiac electrophysiology data and geometric models for use in ECGI research. I. Arganda-Carreras, S.C. Turaga, D.R. Berger, D. Ciresan, A. Giusti, L.M. Gambardella, J. Schmidhuber, D. Laptev, S. Dwivedi, J. Buhmann, T. Liu, M. Seyedhosseini, T. Tasdizen, L. Kamentsky, R. Burget, V. Uher, X. Tan, C. Sun, T.D. Pham, E. Bas, M.G. Uzunbas, A. Cardona, J. Schindelin, H.S. Seung. 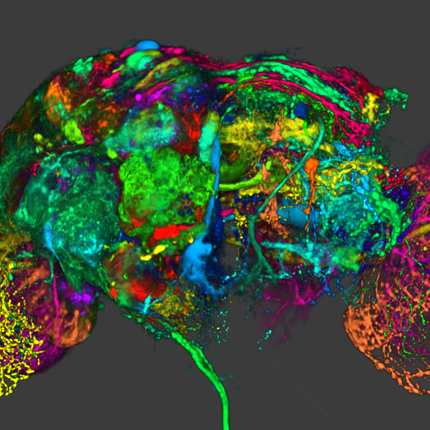 Crowdsourcing the creation of image segmentation algorithms for connectomics, In Frontiers in Neuroanatomy, Vol. 9, Frontiers Media SA, Nov, 2015. 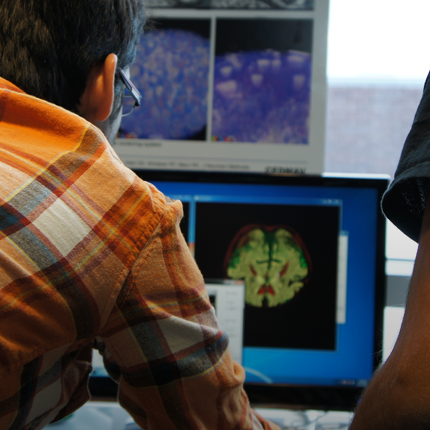 To stimulate progress in automating the reconstruction of neural circuits, we organized the first international challenge on 2D segmentation of electron microscopic (EM) images of the brain. Participants submitted boundary maps predicted for a test set of images, and were scored based on their agreement with a consensus of human expert annotations. The winning team had no prior experience with EM images, and employed a convolutional network. This "deep learning" approach has since become accepted as a standard for segmentation of EM images. The challenge has continued to accept submissions, and the best so far has resulted from cooperation between two teams. The challenge has probably saturated, as algorithms cannot progress beyond limits set by ambiguities inherent in 2D scoring and the size of the test dataset. Retrospective evaluation of the challenge scoring system reveals that it was not sufficiently robust to variations in the widths of neurite borders. We propose a solution to this problem, which should be useful for a future 3D segmentation challenge.